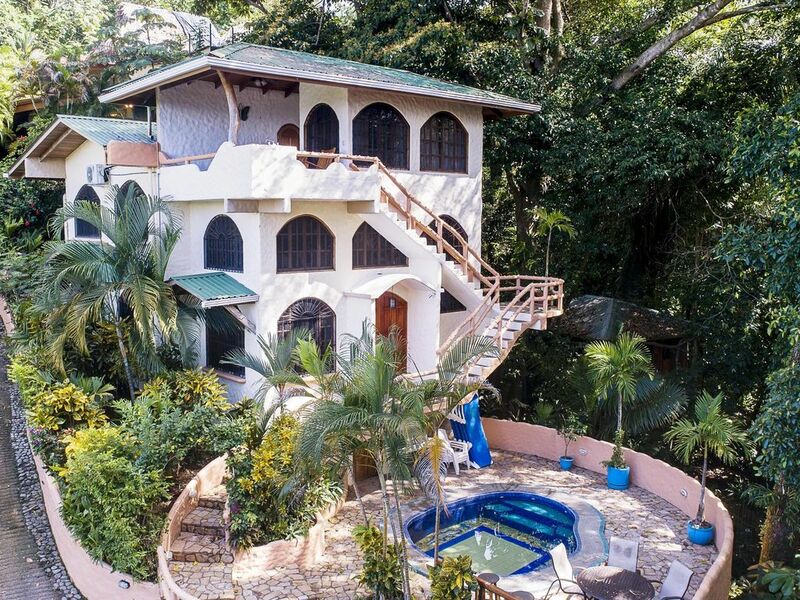 Offers a unique opportunity to stay in a very private house inside the canopy with walking distance access to the most spectacular pristine beaches in the Manuel Antonio area without sacrificing comfort and ease. A comfortable and warm place to stay with your family or friends when visiting Costa Rica, abundant birds, butterflies, sloths and three types of monkeys that visit daily. Easy access to beaches, national parks, tours, restaurants, bars, shopping, supermarkets, banks, hospital, airport, bus station and most services. Beautiful custom stone showers in all three bathrooms. located just a few hundred yards from the world famous beaches of Manuel Antonio. This home includes complimentary housekeeping services (every other day with the exception of Sunday's and Costa Rican holidays). My whole family loved our stay. This is my 4th visit in the last three years. Perfect Villa. Perfect Location. Great Concierge Service. The villa is absolutely beautiful and was perfect for my group of 7 as it provided the space, amenities and everything else that we needed. The rooms are all spacious, especially the first-floor bedroom with the ensuite bathroom. You can't beat the location as it is walking distance to several good restaurants, bars, supermarkets, liquor stores, pharmacy, bank, and a relatively short walk (via the back road/trail) or bus ride to the beach. The terrace on the top floor (with a mini refrigerator) is heavenly and a perfect place to have your morning coffee, afternoon drinks, or just to relax and watch the monkeys and giant macaws go by. The pool is small, but ideal for cooling off after a day of tours/excursions... and pool/beach towels are provided. If you decide to spend a day relaxing at the villa, you can sit by the pool in one of the lounge chairs. Did I mention that there is an outdoor grill? Perfect for some burgers, hot dogs or grilled meat. Two members of my group were celebrating birthdays, so we hired Chef Alejandro who prepared a really delicious meal on our arrival. Everything was so good, especially the grilled whole lobster which was succulent, flavorful and incredibly delicious. The beach is a great place to relax. You can rent a tent, beach chair/umbrella and get a massage, order food/drinks and participate is several watersports/activities. There are several souvenir shops and restaurants by the beach. The wildlife in Manuel Antonio is amazing. The monkeys came by the villa every day and would sometimes play on the top floor terrace and by the pool. We saw the brilliantly colored giant macaws and toucans fly by several times, sloths hanging out at night on the overhead wires along the street, iguanas running around and whales splashing around. We can't wait to go back and would definitely rent this villa again! Great vacation. Loved Costa Rica! House is nice but could use some upgrades. Dishwasher is not secured under cabinets so it warbled and the door hit the next cupboard. Rust on fridge. Stairs were so slippery my daughter fel down one of the flights of stairs. Parking was a big problem. Concierge was great! Restaurants were too. The pictures make it look better than it is. Felt like I was glamping. Needed the perfect place to celebrate Mom's 80th and we found it at Casa Sarita. Zip lining in Costa Rica was on the agenda and this vacation did not disappoint. The house is spectacular and everything we were promised was delivered. This house has it all; comfy rooms, monkey visits, great pool, spectacular view and most importantly Hazel. She made all our arrangements and everything was flawless. We cannot thank you all enough. It as a vacation we and Mom will never forget. Wow great place amazing time. Beautiful house with amazing views. It was just my son and I staying and it was the best experience we had in Costa Rica. Close to everything and such a vacation feel to the home! My son loved the treetop room and deck. Next trip he wants to bring some friends to enjoy it with. There plenty of bed rooms! We look forward to next vacation in the area and will be staying at this Home again soon. Six of us rented Casa Sarita for two birthday celebrations and a fun vacation. It was simply amazing and we'll forever treasure our memories in this GORGEOUS country! The house was the perfect size for us because everyone had their own space and we never felt crowded or in each other's way, especially when getting ready. The concierge associated with the house made activity planning a breeze - we were picked up and dropped off at the house for everything. She also was very helpful in getting a birthday cake, cab rides and answering any questions we had. Also, the amenities are just like home: nice showers, outlets like in the US, wifi, tv and a great kitchen - so you have familiar comforts in a very tropical setting. We heard and saw monkeys, macaws and toucans every day - it's a fun way to have morning coffee. Would rent again in a heartbeat! Manuel Antonio can be reached by a 20 minute flight from San Jose Airport (Juan Santamaria), or a beautiful 2-1/2 hour drive over mountains, through coffee plantations, down the coast through palm fields. The many small towns along the way gives one a great feel for the rural countryside, which is the true Costa Rica. Manuel Antonio is a bohemian mixture of people and places. Restaurants range from simple to five star quality. Great shopping for local crafts and art. This is not a 'surf' town like Tamarindo to the north. Lots of incredible live music. The beaches of Manuel Antonio are world class and the area is truly a tropical paradise.